The Oscars. ... interpret it as you will! Well, since we can interpret as we will, here's how I chose to do that. Rather than run down this years Oscar winners (I believe everyone knows the full list by now) or rant about who didn't get nominated or think that someone else should have won over those who did win, I tried hard to come up with something different. Oscar the Grouch and Oscar Madison have already been written about by several other participating bloggers (including a mash-up of those two characters), as has a list of Oscar-winning movie songs. So what else is there? Well, in the days after the nominations for this years Oscars were announced, I began Googling "Oscars" and phrases like "Oscar snubs" and "Oscar mistakes" and as I typed in the word "Oscar" I was mentally spelling it and into my head popped a famous TV commercial jingle. It seems hard to hear the word "Oscar" spelled out without getting this jingle stuck in my head. Same thing happens when I have to spell out a name ending in "-mayer" or "-meyer" without getting the M-A-Y-E-R part in my head. This has become as inevitable as hearing or seeing the word "Kodachrome" without getting Paul Simon's famous song stuck in my head. I know I'm not alone on that one. And just recently I was calling Fandango.com's 800 number to check a movie time. I spelled out the name as I tried to find the corresponding numbers on my phone keys, and reciting the last there letters, N-G-O, made em think of the song about a dog called "Bingo" in which the name is spelled out. But back to Oscar. I decided this would be my interpretation of Oscar since no one else came up with this one. Avec E-S-P-R-I-T. (With spirit. Esprit is French for spirit). OK, someone else did mention Oscar Meyer hot dogs, which themselves had a memorable jingle, but it was the bologna jingle that came to my mind first. 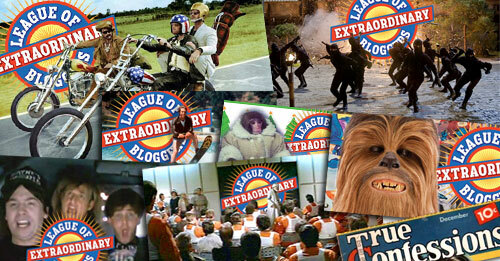 The League of Extraordinary Bloggers is celebrating its first birthday! Can you believe it’s been a year since this whole thing started? As a community, we have had a lot of fun and some amazing blog posts have been written in response to the weekly League topics. I’ve met some great people and really do think that we put our best efforts forward when we write a response to the weekly topic. 1. 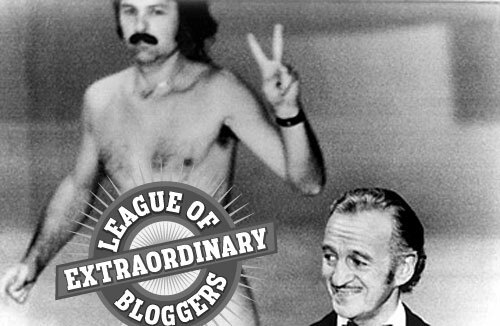 Write about your involvement in the League of Extraordinary Bloggers and recall some of your favorite posts — these could be your own and/or those written by others. 2. Come up with a list of potential topics you would like to see as future weekly League challenges. Who Cried When Old Yeller Got Shot? And I have enjoyed linking other bloggers's responses to my own and getting comments. It's amazing what people can come up with for these things. Book series you have read or are trying to finish reading. I thought of this one because I have been doing just this recently. With so many book series, it gets hard sometimes to find all the books, depending on how you obtain your reading materials. I'd also like to see what others in the League like to read. This could be fun. A toy you remember and/or had that no one else (or barely anyone else) you know doesn't seem to remember. I got this idea from a pin I made last year on Pinterest, of a toy I once had. I had one of those toys in particular and one girl I knew from school said (in a comment) she had all of them, where as another such person commented that she had never even heard of this toy. Sorry, but I don't want to give any more info, just in case. Only one other person has responded to this assignment as of yet (see below for link) and he had some ideas that I was also planning on saying! One was more of the one-word topics that the league used at the beginning of this year. I only responded to the Spacemen one, but still think this is a good idea. And he also suggested this idea: Favorite toy you never had. Kind of goes with my earlier-mentioned idea about toys. You are a lively and energetic person. You feel psyched for so many things. You love novelty, and you're very adventurous. You have many passions. You get bored easily. Day to day routines feel mundane to you, and you like to shake things up. You love to treat yourself, and even the smallest thing can serve as a "pick me up"! Quiz: What is Your Valentine's Day Personality? As far as you're concerned, Valentine's Day is simply a commercial holiday. You don't place any real meaning on it. You don't think it deserves too much celebration. For you, Valentine's Day is just the day you avoid restaurants and candy stores. If you love someone, you already show it. You don't need to go all out for a silly holiday to prove your love. What's Your Valentine's Day Personality? You're quite happy with who you are, and you never pretend to be someone you're not. You just act naturally. It's what works best for you, and you're comfortable with who you are. You like people when they're just being themselves. Nothing turns you off more quickly than a phony. You don't like it when other people want you to measure up to their standards. You should be enough as is. You are a very resourceful person. You are quite clever, and you're always up to something. You definitely know how to think outside the box, and you're quite accomplished because of this talent. You are imaginative and bright. You believe if you can dream it, you can do it. You are always making your dreams come true. You are agile and sharp. You love to figure out how to do things, and you like to keep adding to your toolbox of skills. Welcome to the 2013 Sookie Stackhouse Reading Challenge hosted by Darlene's Book Nook! OK, So I'm doing another challenge. I chose this one since I am in the middle of this series, currently finishing the seventh book. Below are the details copied from Darlene's blog. Although I hosted this challenge for 2012, I did not make any headway in this series. So, I'm going to host it again for 2013! Please read below for the challenge guidelines. 1. The challenge will run from January 1, 2013 to December 31, 2013. Books must be read during this time-frame to count. 2. You can join the challenge at any time! All books read in 2013 count for the challenge, regardless of when you sign up. 5. All formats of books are acceptable: Bound copies, e-books, and audiobooks (as long as they are unabridged). a. Level 1 "Just A Drop":Read 1-4 books in the series. b. Level 2 "A Small Bite":Read 5-8 books in the series. c. Level 3 "So Thirsty": Read 9-12 books in the series. d. Level 4 "Hungry For More": Read all 13 books in the series! 7. When you write your sign-up post, you must choose your level. You can go up but you cannot go down! 8. There will be a separate linky for your reviews, which will be posted on THIS page. 9. There will be a linky for your wrap-up post at the end of the year. 10. Create a sign-up post and link back to this post. Sign up with Mister Linky below! Be sure to use the direct url to your sign-up post and not the url to your blog. 11. Grab the challenge button and post it in your sidebar. Copy and paste [the] HTML code into an HTML gadget for your sidebar. I'm choosing Level 3, in case my library doesn't get the last book when it comes out this year. But if it does, I will go to Level 4. I'm also doing a complete the series challenge, so this will work for that, too. To sign up, visit this link.